A couple weeks ago, I was up in this area, about two peaks over, and temps were in the low 90s, even at 6000+'. Today as I started out on the Miller Peak trailhead at around 1030 am, it was 40-50 degrees cooler. I'd been putting off this hike as the trail is open to and quite popular with, motorbikes. 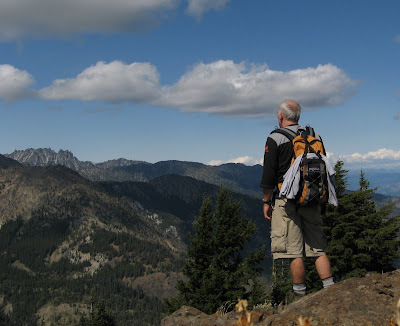 But I wanted to strike it from my list as it is the easternmost hike in the Teanaway realm and the last hike in the region that I hadn't completed. Almost immediately I had second thoughts as a group of 10 riders passed me within 500' of the actual trailhead. But they were all respectful and friendly so I continued on. As it was, I only saw two more riders during the next 13+ miles. As most trails in the Teanaway basin, the Miller Creek trail starts easy and flat but within a couple miles starts climbing up the ridge smartly, often through surprising patches of first and second growth forests. Various creeks and streamlets are crossed and as elevation is gained and trees thinned, views open up to the south and the north revealing Mt Rainier nearly covered in mist and the Stuart Range, peaking out above the Navaho Peak ridge. At 5000 feet you can relax a little and catch your breath and drink in the beauty of the high country. A light wind rustles through the dried arnica, their bright yellows flowers long since gone. A marmot whistles in the distance, hiding amongst the acres of bare rock. Various peaks and ridges, in virtually all directions, fill the camera frame and best of all is Miller Peak, looking not all that far away. The last 1000' to the summit is straight up over loose rock, but once on top, one finds a little flat area with a few trees and plenty of cozy places to sit and soak in the scenery. Cell phone reception is possible here, so it's a great place from which to send a picture message to that friend who couldn't be with you. Below the ridgeline to the south was an enticing side trail not indicated on the maps or GPS, which for that very reason had great appeal to me. Down I scrambled, nearly 1000 feet, and soon I was heading east on this seldom used trail, which I hoped would eventually hook me up with the Bear Creek trail, leading me back to the car in a nice, long loop. The trail was very pleasant, following just below the ridge with wide open views to the south and wast. I was a little concerned when the trail did not descend into the Bear Creek valley, but continued east. I kept expecting it to change direction, but it never did and pretty soon the trail just petered out, leaving me with very nasty scramble down a steep ridge to the very headwaters of Bear Creek, which I followed for nearly two miles, before picking up an old, un-maintained trai (probably the original Bear Creek Trail). Eventually that led to the main trail and by 6 pm I was back at the car, worn out after more than 7 hours of hiking. I'm calling this "Jammin' Pass" Loop as I was listening to a Bob Marley tune when I passed a very clear defile in the ridge which seemed like a passage between north and south, a portal from my familiar stomping grounds of the Teanaway Valley through a hole in the ridge north to Chelan County and the unexplored regions of Ingalls Creek and the Stuart Range.